For most of his life, Everett has never eaten well. Having complications early on with severe GERDS and failure to thrive, our little baby has never learned to feed well from a bottle or the breast. At 8 months, we enrolled Everett into an intensive feeding program in Dallas, TX. Despite receiving intensive, inpatient therapy, we left the hospital with a mini g-button. Thoroughly discouraged, Everett became 100% tube fed as we continued with feeding therapy. By February 2015, Everett’s oral aversion had gotten worse. We could not get anything near his mouth. Tired of seeing him cry during his therapy sessions, we finally fired his therapist. We found Notube from a family who had successfully been through the program. 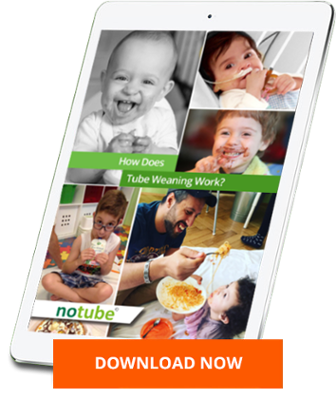 In March 2015, we joined Notube and never once regretted our decision. Just a week into the Netcoaching program, Everett was drinking water from a cup. Just like a big kid! By week 3, Everett was eating yogurt like a champ! As we entered the month of June, Everett was already 30 days tube FREE! He continues to eat soft purees, but is gradually accepting (and swallowing) bits of solid foods, like pizza, chicken wings, ribs, and fish! Our baby is finally eating! I cannot thank Dr. Dunitz-Scheer and Dr. Marinschek enough! Seeing Everett learning to eat independently is priceless!